Arguably the most well considered and capable of any full-frame mirrorless camera on the market. Nikon has got the lens mount right, the quality right and, despite strong competition from Sony's well-established range and Panasonic's forthcoming S1, we think any photographer would be mad to not give the Z6 a look in. Nikon has been a bit down in the dumps in recent years. Natural disasters causing delays and then product ranges to be canned entirely, blips in management decisions - what were those KeyMission cameras all about, eh? - and, well, a lack of anything new and exciting while Sony, Canon, et al, were running away with various successes. Then came the Nikon Z full-frame mirrorless series to crush any of the doubts. This full-frame camera series - which comes in two flavours, the 24.5-megapixel Z6, reviewed here, and the ultra-resolute 45.7-megapixel Z7, which was first to launch - features a completely new lens mount (the aptly named Z mount) and is a landmark release for the long-established Japanese camera brand. Nikon Z6 vs Z7: What's the difference? We've been using the Nikon Z6 for a number of weeks to see whether Nikon has cracked the mirrorless full-frame conundrum, or whether the Canon EOS R, Panasonic S1 and Sony A7R III are more viable solutions. Nikon's history with mirrorless cameras has been a turbulent one. Putting all its eggs in the one Nikon J-shaped basket some years ago, that entry-level series since went on to be axed. But its legacy left some worried that Nikon's approach to full-frame mirrorless would be similar; and nobody wanted a watered-down approach. Fortunately the Nikon Z rights and wrongs of the J-jaded past. The second you pull the large-scale Z6 camera out of the box - although it's not too big; its lens mount is smaller than the Leica one used in the Panasonic S1, while Z lenses aren't as epic-huge as those in Canon's EOS R either - it looks and feels, well, like a 'mirrorless DSLR' in some respects. Jackpot - as that's what people had been asking for. 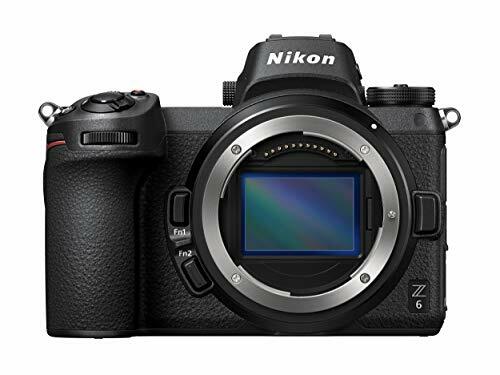 The Z6 is well built, it's robust, it's weather-sealed (to the same standard as the Nikon D850), it's got all the buttons and dials in the right places so it's familiar to use for any Nikon user or newcomer/enthusiast. Using the camera feels natural: the toggle to the rear is ideal for quick adjustments and positioned well should you be using the camera up to your eye; and that electronic viewfinder is such high quality that it often doesn't seem like an electronic one at all. There are some slight changes we would make though. Although the 3.2-inch LCD screen is of ample quality, we'd switch out its tilt-angle mechanism to a full vari-angle one for greater flexibility. We always use adjustable screens these days for our work - which is something many traditional DSLR cameras lack - and think Nikon could have gone all out here. The other obvious moan we have is the presence of a single XQD card slot. It's an unusual card type (and an expensive one) that we've seen featured in other cameras before - but either as a customer choice or with an SD card slot alongside it. Think of it as a purchase tax in the Z6's single card slot format, because a 32GB card is three figures and the card reader costs just as much again. It's also worth mentioning that the Z6 is identical in form to the higher-resolution Z7. It's only some slight spec differences (resolution, number of focus points and burst speed) and the badge between the two that differ. Oh, and the Z7 is a lot more cash to boot. While Canon tends to opt for simple area focus on many of its mirrorless camera models, the Nikon approach is a little more varied and precise. Not only does the Z6 offer 273 phase-detection autofocus points, encompassing 90 per cent of the frame, you can adjust from auto to wide-area, single-area or pin-point focus. It's the last of those that we've found really important. Yes, moving the pinpoint around the screen with the joystick is a little slow and laborious, but with a full-frame sensor at your disposal critical focus and aperture selection are integral to pin-sharp focus - which the Z6 is very capable of producing. As such we've been shooting many frames with pin-point, adjusting the point slightly to ensure the in-focus depth of field is on point. Switch to continuous autofocus and things remain capable, but we can't shake off the fact that the Sony A7R III offers some incredible subject tracking from its active focus system (it has more focus points to utilise, which is part of the reason why). Furthermore, Sony offers EyeAF for automatic lock-on to human (and animal) eyes. This might sound gimmicky, but it's a joy to use - and is something Panasonic pulls off well in its Lumix S1 full-framer, too. Still, even without some of the extra bells and whistles, we've been able to get some incredible shots using the Z6. On a farm in Stellenbosch, South Africa, wild foul were easy targets - and the level of detail shown in an image of a cockerel is staggering. Considering that's from using the 24-70mm f/4 - which is sort-of the most basic among the Nikon Z lenses at present - is impressive, as there's better quality glass that can be bagged (if you've got the budget for it). Another major boon in the Z6 is that there's in-body image stabilisation. The larger and more resolute a sensor, the more beneficial image stabilisation is at an image level. Sure, you can't see the active benefit of stabilisation as you would through a lens-based solution, but having that added assurance that hand-held shots will be extra sharp at even fairly low shutter speeds is highly reassuring. When it comes to burst shooting the Z6 plumps for a whopping 12fps maximum, putting it on par with the company's top-end D5 DSLR camera. The buffer isn't as capacious, though, so if you're shooting raw then you're not going to get more than three dozen shots. That probably won't matter for most people, frankly. The immediate benefit of this mirrorless camera is that it can be completely silent - so if you're shooting, say, golf or trying to be discreet on the street then its electronic shutter option is perfect. Battery life is fairly reasonable, too. We shot close to 400 frames - many of which were from burst - before the battery called it a day. Recharging occurs through a separate charging cradle, none of this direct-in-camera USB slow nonsense to worry about. However, with a bit of video capture and single frames shot over a long day, we doubt you'll get anything beyond 320-350 shots per charge realistically. That's fine, it's a mirrorless camera after all, but it's nowhere near the bevy of shots you'll get from a pro-spec DSLR camera. That's just one of the compromises to consider. So far, so good. But where the Nikon Z6 really excels is with its image quality. It's hugely impressive. That's down to a combination of things: the sensor and image processing, sure, but the new Z mount is showing its colours early on too. The potential here is massive - it's the next evolutionary step in sharpness and, in a few years, we expect many current DSLR users will have moved over on the strength of this lens mount alone. That said, the 24-70mm f/4 has some corner softness and vignetting at the widest angle - and that's a bit of a downside for a £1,000 lens. The centre point is super crisp, though. In addition to the sharpness is the sheer depth that a full-frame sensor offers. That extra size just creates melty blurred backgrounds and pronounced shallow depth of field that can't be achieved from lesser kit. You'll need to be hyper critical about focusing, but the pay-off is well worth it. Equally impressive is how the ISO sensitivity holds up. The lowest ISO 100 (which is native - no 'Low' setting required) delivers pristine shots with a good amount of dynamic range - although you'll want to shoot raw to pull on the shadow and highlights details, as JPEGs have their inevitable limitations - that looks more-or-less identical through to ISO 800. The higher ISO sensitivities hold a fantastic amount of detail without excessive image noise disrupting the aesthetic. You'll see more grain from ISO 1600 up to ISO 6400, but it gives it a film-like quality, while colour noise increases but is marginal. We've been shooting in a low-light museum in Cape Town, South Africa, and even ISO 5600 shots are easily passable. Push it to ISO 16,000 and it's less impressive, while the top-end ISO 51,200 isn't a total write-off, but it's of really limited use. If 24.5-megapixels isn't quite enough for you then the Z7 is likely the better path for you to take, with its 45.7-megapixel sensor. It won't perform quite as well in low-light, mind, and its ISO sensitivity is capped a little lower as a result, so that's the trade-off to consider (ignoring the sizeable price bump). Spin the clock back and it was Nikon that first introduced video in a DSLR camera - the D90. However, it quickly lost ground to its competitors and has been a little slower in taking up the opportunity to sit in pole position again. The Z6 pulls out the stops here though. With 4K capabilities at 24 and 25 frames per second, along with up to 120fps at Full HD (1080p) there's a lot of benefit to be taken from this full-frame sensor. Ok, so it's unlikely to usurp the Sony A7R III, but with all kinds of high-end features - 10-bit clean HDMI out and N Log - along with two 3.5mm jacks for headphones and microphone, it's well equipped for quality capture. When Nikon first announced the Z series we were holding our breath that it wasn't going to go the same way as its ill-fated (and arguably ill-conceived) J series of mirrorless cameras. Having used the Z6 for two weeks, it's very good news indeed: this is a full-frame mirrorless with an incredible new lens mount, exceptional image quality, superb ease of use - and a camera series that knows its target audience. Compared to Canon's slightly leftfield take on the mirrorless market - its EOS R and EOS RP are somewhat different and many DSLR users are confused who they're aimed at - the Z6 really hits the nail on the head. It embraces its new lens mount and it doesn't try and cut specification short of Nikon's DSLR line-up either. It's just an all-round exceptional camera. It's not totally perfect though. We'd like to see continuous autofocus improvements to see it take the crown there, EyeAF would be greatly appreciated as an addition, too, while the XQD card slot choice seems like an oddity to us. In respect of everything the Z series gets so very right, however, these are small downsides - and at least there's room for tiny improvements for the next one. Overall, the Z6 is arguably the most well considered and capable of any full-frame mirrorless camera on the market. It's got the lens mount right, the quality right and, despite strong competition from Sony's well-established range and Panasonic's forthcoming S1, we think any photographer would be mad to not give the Z6 a look in. It's exceptional. The Leica mount means the S1 has larger lenses, but there's a lot of potential from the German brand to deliver added greatness to the Japanese maker's camera body. We love the EyeAF and general ease of use, which will likely see this a success to a niche user base. It's fairly late to the game, though, which might cost it. Impossible to ignore for its video and autofocus prowess, the well-established Sony is the number one brand in mirrorless is the USA for good reason. We think the Z mount has more potential, but the Sony is certainly hard to ignore.